#51 29th Sep 2008 at 6:35 AM Last edited by Havelock : 29th Sep 2008 at 8:00 AM. One question: Is "Diagonal Molded Belt" hidden somewhere? How stupid of EAxis to omit Diagonal pieces. If a room has even one diagonal wall, the whole set becomes effectively useless. Its on the way i have to do some testing if it works correct. Your work on this is greatly appreciated! THANK YOU! Lord Darcy - (About the Club counters trim): yes, I will update the Extra to include this fix. I wonder how no one complained about that glitch so far: those trims with a different colour are horrible! SimSample - That's my fault; the bugfix is ready: I'm only finishing to activate the automatic straight/diagonal selection, and waiting for the last diagonal from Havelock. Here is unlocked diagonal Belt and fixes for the diagonal and corner LOD90. They have messed up diagonal lod it was to short and the cornerlods where on the opposite place as the real corner resulting in odd look from neighborhood view. Thankyou Numenor, Lord Darcy and Havelock. I didn't realise that Havelock was meaning the same objects as I was! [QUOTE=simsample]If you mean the OFB column, then that is part of the CEP Extra files. The column disappeared with later EPs and the CEP extra should reenable it. Check that you have the CEP Extra options installed. And it still does not show up in my game. Ang41187 - I'm sorry, but Maxis created the mesh in one piece; in order to make the two parts recolourable separately, I should modify the mesh (which I always avoid, unless strictly needed). In the meantime, you can put his files in the Downloads, but remember to REMOVE them before installing the newn CEP. It should be found in the Build catalog, in the Multi-storey columns section. I actually got it to work, but I had to uninstall AL & CEP and then reinstall them again. I suppose it was just a glitch. The column is back! #61 30th Sep 2008 at 9:16 AM Last edited by Lord Darcy : 30th Sep 2008 at 12:22 PM. 1) Is it possible to make unbuyable objects recolorable, like BV souvenirs / collectibles or NL date reward flowers? I realized that I use BV souvenirs a lot. It would be nice if we can have multiple color choices for those objects. 2) Is it possible to make Box subsets in Expedit TV recolorable? 3) Could you add FT Food Judging Table? 1) Yes, the only limitation is that the recolour must be applied with the Design Tool after the object has been placed in the lot; i.e. you can recolour a collectible after placing it on a shelf (and it will stay that colour from that moment on), but the ones you find digging will be all in the default colour, until you use the Design Tool over them. 2) It's the IKEA one, right? Yes, I will add the IKEA objects later on. 3) Yes, but only the surface (I mean everything visible when there is NO contest going on); the ribbons must be blue, so to match the "Accessory - Blue Ribbon" object created in the sims inventory when they win the prize. If I only have up until Bon Voyage, can I use this latest CEP for Apartment Life too? Yes, each CEP version is backward-copmpatible with older games. Please let me first say that I really appreciate all the time and energy you put into your programs. It is amazing what you can do, and how much you add to all of our games! I come here today to let you know about a problem that I discovered with the new 9.0 version of the CEP. I installed the CEP the day it came out. I have used no MATY patch at all. Today I installed the EA patch and my Ergo windows suddenly lost all color choices but red. I reinstalled the CEP thinking perhaps something was accidentally overwritten by the EA patch, but they were still missing. So, I removed the GMND file from my downloads folder and suddenly all of my ERGO colors were back. Don't know if this info is any help to you, or if you need any other info, but felt it was something you should know about. Thanks again for everything Numenor! **Deepest thanks to all of you who build/create wonderful things for our simmies to enjoy! I come here today to let you know about a problem that I discovered with the new 9.0 version of the CEP. I installed the CEP the day it came out. I have used no MATY patch at all. Today I installed the EA patch and my Ergo windows suddenly lost all color choices but red. I reinstalled the CEP thinking perhaps something was accidentally overwritten by the EA patch, but they were still missing. If you dont own OFB remove CEP-EXTRA_OFBWindows-Fix-for-AL from your CEP-EXTRA folder the fix is only for People with OFB because AL has broken recolors for the Ergo windows. I have OFB, but thank you Havelock. Edited to add: The Anygame configuration included all EPs except for PETS/Freetime (which I don't have) and did NOT include any SPs. So Uni, NL, OFB, SEAS, BV, and AL. That's it. I have started my Game with CEP and all Ergo windows are recolorable even in Belladonna Cove. Only Belladonna Cove windows are red now. I have patched my Game also. *Helpless shrug* I don't know what to say except I had them before, then I installed the patch today and I didn't. When I removed the GMND file from the Anygame downloads they came back. I didn't mess with any files or anything, and I did try to re-install the CEP to see if it would fix it. I'm really not trying to be a pain ...I just wanted to let you know what happened to me. I just build, and I usually build Maxis Only. I like the CEP for my personal game, not my "clean" building game, but it automatically installs it in all the Anygame configs as well. That's why I noticed it so quickly, and why I know it isn't conflicting with a "hack" or a "download"...as there ARE none in that game. Just for information, the AL Patch 1 doesn't seem to fix the OFB 'Ergo' windows. 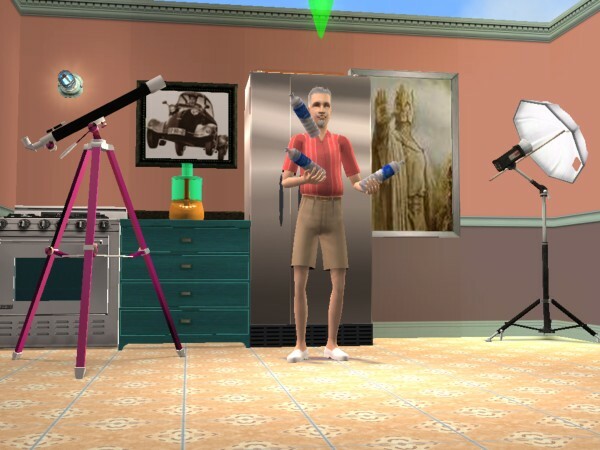 You'll still need the CEP extra file to have the Maxis recolours. Just to clear up this important point (the connection between the CEP and the AGS/BGS), it is true that the CEP is automatically copied into each mini-game, but the core files only: the Extras are NOT copied into the mini-games. Therefore, a "full game" including AL, with the CEP installed and also the Extras to fix the Ergo windows should work fine (Ergo windows recolourable; old recolours usable on them even in AL). But a "mini-game" (created with the AGS or the BGS) that includes AL, will not benefit of the Extra, and therefore the Ergo windows will be broken (not recolourable at all; existing windows revert to red). Tysana - Have you tried applying a recolour (using the Design Tool) over the reverted-to-red windows? Is it possible? Also, please confirm me that your problem with the reverting windows happens in your full game. Ok...will take me a sec to open it up. I did try the design tool in the AnyGame, but it didn't have any options. Will be back in a few. Ok...here's the deal - I reinstalled CEP, making sure I included all the extra packages. I opened my full personal game with all EPs and SPs, and the choices were available for the windows. So, I decided to check the Anygame to see if I had made some kind of CEP error. (Maybe accidentally installing a previous version of CEP or something. Embarassing, but I had to be sure.) Guess what? They're missing again. The windows that I had previously placed after removing the GMND file were still black, but the only color choice I have to place now is red...and when I try to click on the window to change the color it says that it isn't designable.